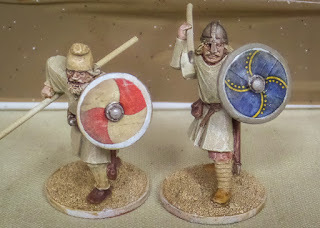 It's a couple of months since I posted any new painted figures, so I am really happy to have finished these Danes from Saxon Miniatures. As with most dark ages figures, the biggest impact comes from the shield - the figures are almost just something to hang a shield on. These are half and half transfers and hand painted. I was pretty pleased with how they blended together. 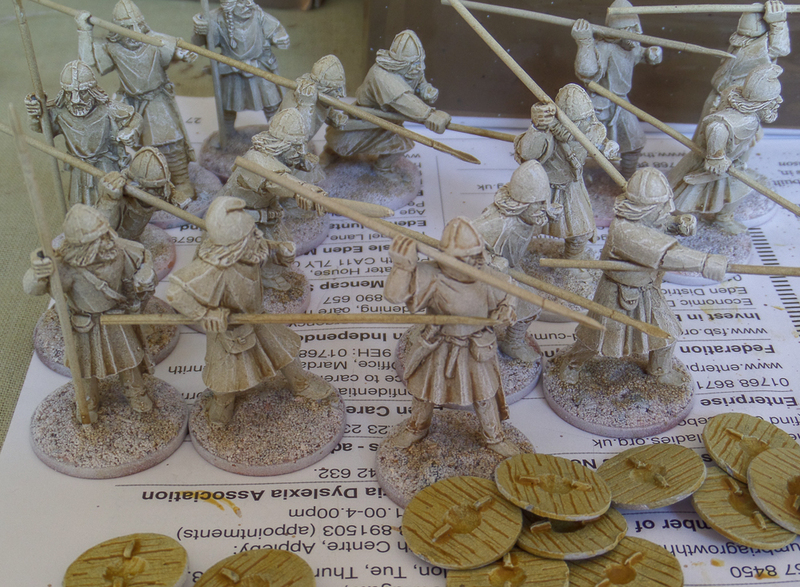 Sixteen unarmoured figures gives me two points of a Saga force. The next set of Danes to paint are the final nine from the starter warband, which are the armoured warriors and the leader. 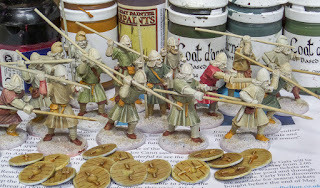 I want to crack on with them and get them done as quickly as this first set, then perhaps add a unit of archers to give a reasonable sized force for a game. I have resisted using shield (or banner) transfers in the past, for two reasons. Firstly, I think they are expensive! Secondly and more importantly, everybody seems to use them and you can feel a bit of shield transfer fatigue when you browse through images on various forums and blogs. 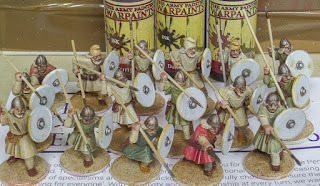 However, when I bought the Danes from Saxon Miniatures there was a set of transfers thrown in as part of a deal, so it would be silly not to give them a try. I had read on a forum somewhere that they can be fiddly to apply. This was my experience with the first couple, but then I got the hang of it and it wasn't too bad. I have 16 shields in the unit, half are hand painted and the other half are transfers. The biggest problem was that they do not fit - or rather they do not fit all the shields. They are obviously designed to fit the rimmed shields. The instructions are to paint the shield face white before applying the transfer, so any size discrepancy results in a white border. You can see this clearly on the left shield, but there is also a little on the rimmed shield on the right too. 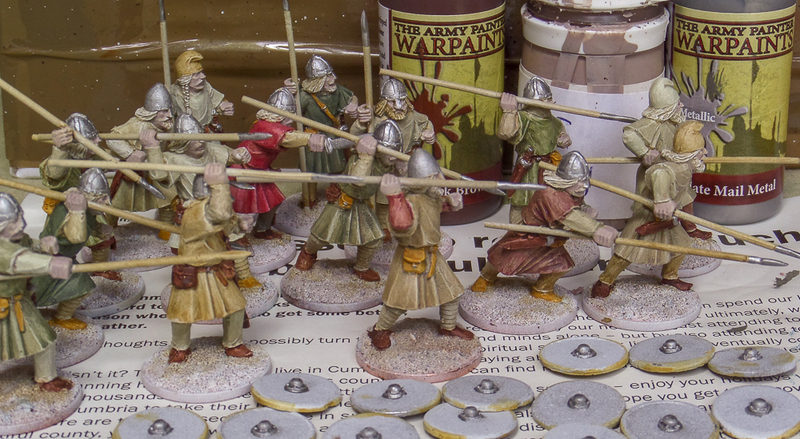 Now that I have fitted them I will have to go back and cover the white bits. Dark age warriors would often cover the edge of their shields with strips of leather to strengthen them and prevent splitting of the wood, so luckily I can paint the white bits as leather. I'm not sure what you would do if it was a medieval metal shield, I guess you would just have to blend it in as best you could. I like the designs, they are really nicely done and I can see the attraction. The more intricate examples are lovely and it would be a real challenge to replicate them by hand - imagine trying to achieve anything like these Irish symbols. The simpler designs like those in the photo above are not impossible to achieve by hand/brush. In terms of time, adding in the covering of the white borders, it will have taken me roughly the same for applying transfers or painting by hand. The main attraction to me would be the very intricate designs that are nigh on impossible to achieve with a brush. After trying these first few transfers and learning a few lessons, I think I will probably get more for future additions to my dark ages and medieval collection. I probably should have fixed the shields on at the end of stage 7 to allow easier access to the hair and beards in stage 6, but you know how impatient you get! Obviously the shields are not yet completed and they make up a big part of the impact of the unit. I am going to try a few transfers on some of them, along with some easy hand painted designs - that probably merits a new article. Photos of the completed unit coming soon. 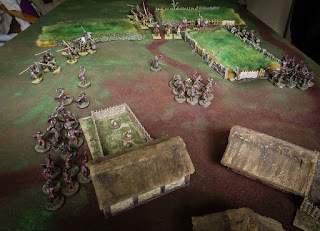 It's been a while since I rolled any dice, but over the weekend I managed to squeeze in two games using the Dragon Rampant rules. I can just about field 4 units plus a leader with my Rohan collection, easily matched by my more numerous orcs collection. 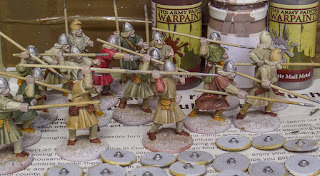 This meant around 35 to 45 figures per side, in five units each, which gives a reasonable skirmish size force. In points terms this came to around 25 to 28 points, we were fairly casual when adding up the totals. I used a few of my dark ages buildings to represent the outskirts of a Rohan settlement, and just a few fields and hedging to complete the setup. Playing on a 5x3 board does have it's limitations, but it panned out pretty well. In both games the Rohan forces were riding to the rescue of the villagers or trying to prevent the orcs escaping. Dragon Rampant is a good fit in this setting - there is a little sameness in the profiles, but if you don't mind warg riders performing in the same way as Rohan horsemen then it's a satisfactory system for a relaxed gaming session. A nice way to spend an afternoon, even if my opponent did complain about the lack of biscuits! My hobby time over the past month or so has been, much like the English summer, a complete washout. Commission painting, holidays and Total War Warhammer have all taken their toll. Combined with my decision earlier in the year to paint dwarfs to a high standard, I feel like I have made very little progress on Mount Unpainted. 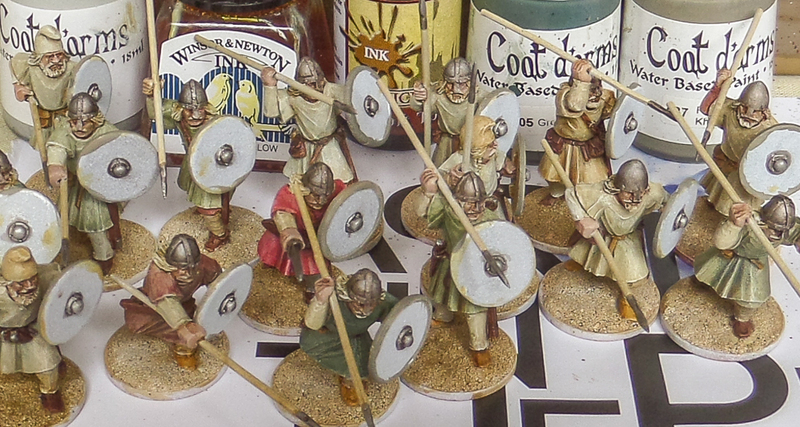 So, I am planning to blitz through some easy and quick-to-paint figures, starting with these Danes. 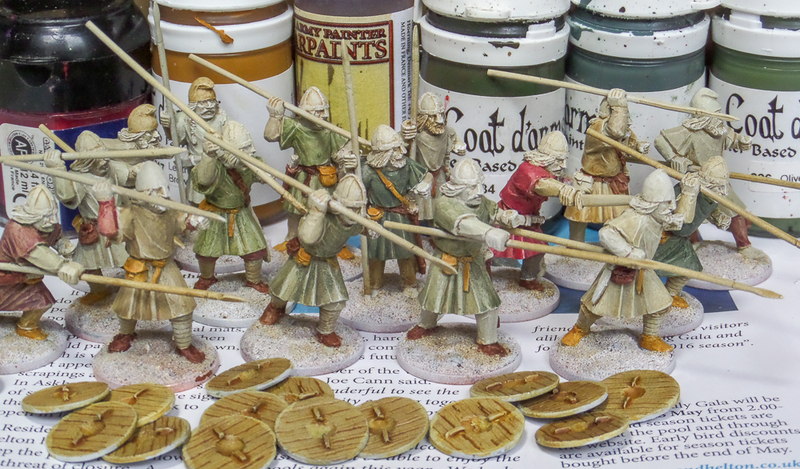 These are from Saxon Miniatures, nice enough sculpts for historical metals, not overly detailed so I should be able to get them done quickly. 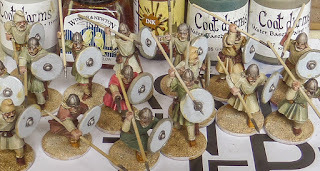 These are the unarmoured figures from the Anglo-Danish warband deal, which also includes eight armoured figures plus a warlord. As usual, I have mounted them on pennies, I will add the ground texture before priming.